Take part in our creative writing project with Goldsmith’s College. This Spring Term we will be working with the writer Katherine McMahon and Goldsmith’s University to write and then publish our own creative writing prose and poems on the theme of “My Thoughts, My Feelings”.​ Last year many of our children took part and had their work published! Rambert are in residence in the Spring Term. 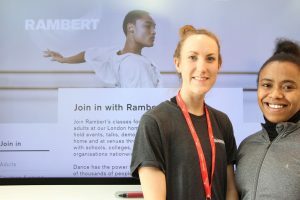 During the first half of the Spring term, Rambert will start a project working with our school children and young people. All ages and abilities are welcome to join in and enjoy. These Thursday morning workshops will be based around a dance-work from Rambert’s diverse and iconic repertoire. They will include a contemporary dance technique warm up and the chance to learn the choreography. Students will also be encouraged to create their movement. RADiate with the Royal Academy of Dance. In the Spring Term we will be taking part in the RADiate project with the Royal Academy of Dance. The RADiate project aims to deliver fun, creative and sensory dance sessions to children in special schools. Join us on Thursday for our Circus Skills workshop. Join us on Wednesday for our African dance workshop with Dance Days. Open to the public from 13 – 18 July at the Evelina Children’s Hospital School. Art has an important place in the ECHS’s curriculum. We find that it usually engages the children and young people and at times our parents, who find it therapeutic and relaxing. Many chats, confidences and explorations of their own life situations happen whilst we work together completing an artistic task. Here at the ECHS we are immensely proud of the achievement of our pupils and very happy to showcase their work. Because children come and go and some only come for one day, you’ll find that many pieces are the products of collaborative work, and in some instances over weeks, and across all the areas of the school. Other exhibits are created with guidance or adult support. With children who have profound and multiple disabilities, we support through using hand on hand methods. Most pieces were created completely independently. The exhibition‘s theme is “The World Around Us”. We have been inspired by different artists, including the likes of Gustav Klimt, Vincent van Gogh, Paul Klee, Amedeo Modigliani, Henri Matisse etc… We also worked on African silhouette art and on Adinkra prints. Our school has been fortunate enough to have had talented illustrators visiting us, including; Richy Chandler, Maja Sten, Jane Porter, Laura Carlin and Axel Scheffler. With Jane Porter the children were collaborating to create a book full of wonderful images, which we are very proud of. Another major inspiration to us is our wonderful nature surrounding us. The art pieces were created exploring and using various techniques, such as collage, painting, hand prints, tape resist, crayon resist, newspaper art, cut outs, multimedia and much more. We hope that you will enjoy looking at the work and celebrating with us the creativity of our children. As a part of celebrations of our World Maths Day 2017 celebrations Maths on Toast came to hold a Festival of Triangles! Children have been busy building lots of triangles to make tetrahedrons. We are now putting together the tetrahedrons to make a giant Sierpinski tetrahedron! Finally here is our giant Sierpinski tetrahedron. As part of our World Book Day 2017 celebrations we were lucky enough to have the author and illustrator Jane Porter working with us for two days at the end of which we produced our very own book! Jane began her project with a morning on dialysis ward, where she helped the children create some beautiful rainforest creatures. She also visited other wards, and spent a day in the classrooms creating the narrative of the book and working on the layout of the colourful pages. Our finished book is a beautiful collaborative, one-off, hand-made large collage book on the theme of rainforests including a bit of science, ecology and geography but in the form of a story narrated by a parrot! Jane commented “ The work the children produced was wonderfully exciting and vibrant” . She has now put it all together into a hand-bound book for us to treasure , to read , and to exhibit in our Art exhibition in July. Thank you Jane. Click here to find out what we did. Have a read of his blog about his first visit to Evelina Hospital School via the link below.